Every bite and drink counts. The moment you ingest something, it moves through your body, creating positive or negative effects in various places. A donut or sugary drink, for example, creates an immediate high and then does more damage than good by the time it passes through. A leafy green salad, in contrast, functions like a virtual housekeeper as it cleans bad elements from your body and deposits nutrients. When I was in high school, my biology teacher demonstrated what happens to the human lung as people inhale cigarette smoke. He actually lit a cigarette in our classroom and showed us how the virtual inhaling of smoke created yellowing and browning of a white sponge. It was a powerful visual showing what’s happening to your insides when you smoke. Unfortunately, there is no easy way (at least yet) to see the deleterious effects bad dietary choices have inside your body. Yet, the food and beverages you consume can be just as detrimental as chain smoking. When researchers brought people into a lab and tested the effect of a single poor meal, they made a few surprising discoveries. One group had a healthy meal consisting of salmon, almonds, and vegetables. The researchers conducted an ultrasound of each person’s arteries a few hours later. In this group, people’s arteries dilated normally (compared to an initial baseline scan) and maintained good blood flow. A second group was assigned to eat a meal consisting of a sandwich with sausage, egg, and cheese and three hash browns. This group also had baseline ultrasound scans of their arteries and follow-up scans after the bad meal. After eating just one poor meal, the arteries of participants in this group dilated 24 percent less than their original state. 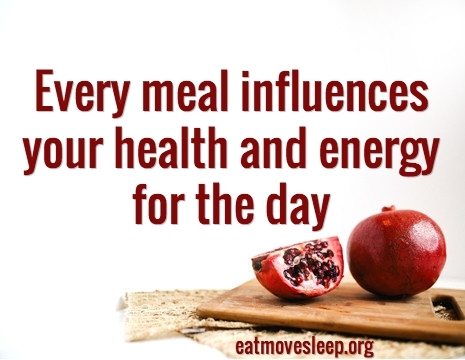 This study suggests every meal influences your body’s ability to function properly. Each ounce you consume is either a net positive or a net negative by the time it runs through your body. You don’t get healthier by simply trying to eat better in general. You improve your health on a bite-by-bite basis. Once you know what foods and drinks do more good than harm, weigh your choices throughout the day as if you can see the immediate impact of each decision inside your body.